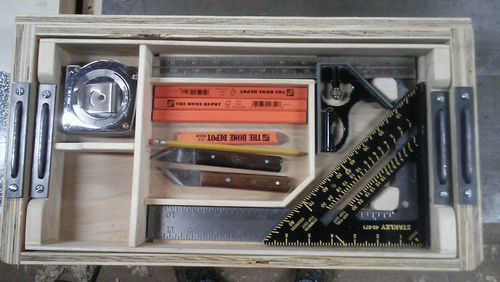 I finished creating the dividers and gluing them into the bottom of the box. Then I broke the edges with a chisel and sanded the facets away. ...and with tools. The pieces parts on the top right edge are the iron and wedge for that skew rabbet. I like the clamps, plane, and files being here. The other compartments’ contents are really up in the air. No changes, except for the vise grips being added when the clamps moved down. No changes here at all. The squares and such only used about half the depth of the tray. So I added what will eventually be a clipboard. It also functions as a cover for the layout tools. 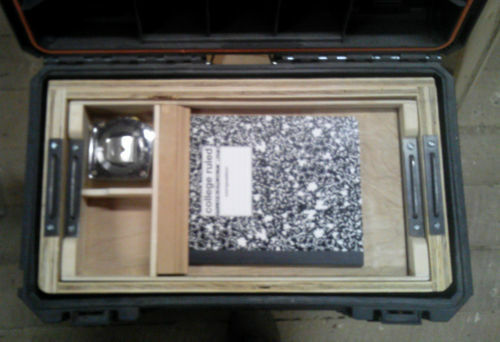 I just have to cut the spine off that notebook and then drive a few screws from the bottom through the paper, and into the molding. I’ll use clamps to draw it all tight and the screws to hold it together, versus trying to simply draw it tight with the screws; I don’t want to strip them. Purgatory, the place where tools become round. 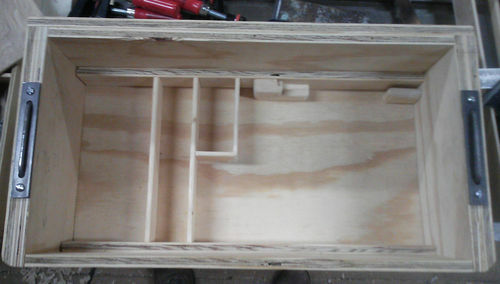 The loaded box in place, sitting about 3” above Purgatory. 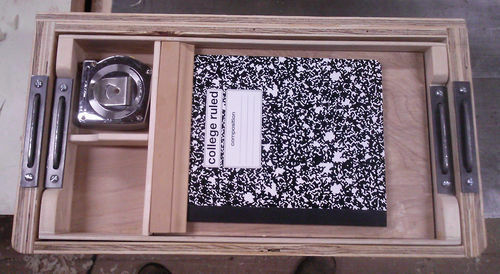 Ok, and except for the clipboard, construction is complete. Next is some combination of final sanding, sealing, and paint. I have pretty much squeezed all the fun out of the construction process. I am ready to move on to the next phase. Looks good. I like to see how it works in the “field”. Ha, you and me both, brother! 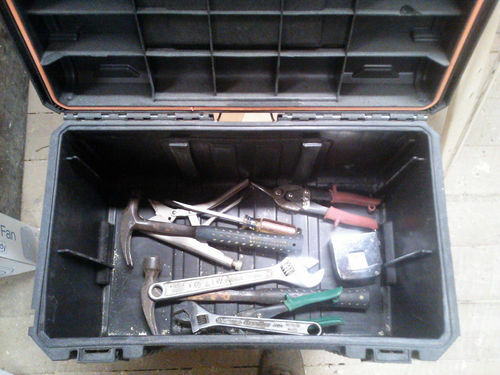 The toolbox is intended to be used in and around the barn. The jury is still out on its durability, specifically with the glue-joints between the wooden box and and the lip that lets it sit in the Ridgid. Between the staples and the glue joint however, I think there’s no real danger of failure. 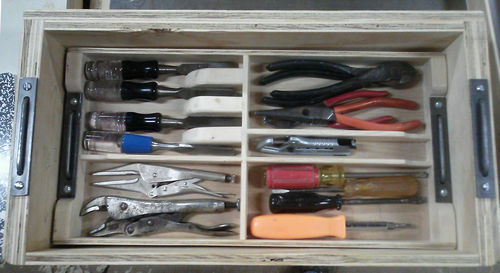 I like to work out of my toolbox. That is, I pull a tool, use the tool, and put the tool back immediately. I expect to have the trays out of the box and directly accessible. I won’t be moving trays in and out of the box while working. In any event, my gut tells me the tools are better in the trays than piled into the well. Believe it or not, this project is “inspiring” to me. 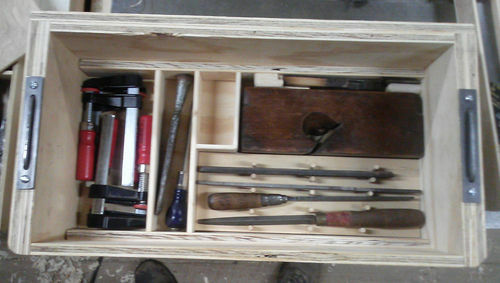 Back in the days of dinosaurs, I took a 1 semester shop class and managed to really “mung up” the assignment of making an extremely simple toolbox. You’ve taken the idea, broken t down into manageable parts, explained the process and the problems you ran into in such simple terms and photos that even I can understand and follow, and thus “inspired me” to try something similar in my first real project after I make a crosscut sled and a drill press table (I’m just starting out).